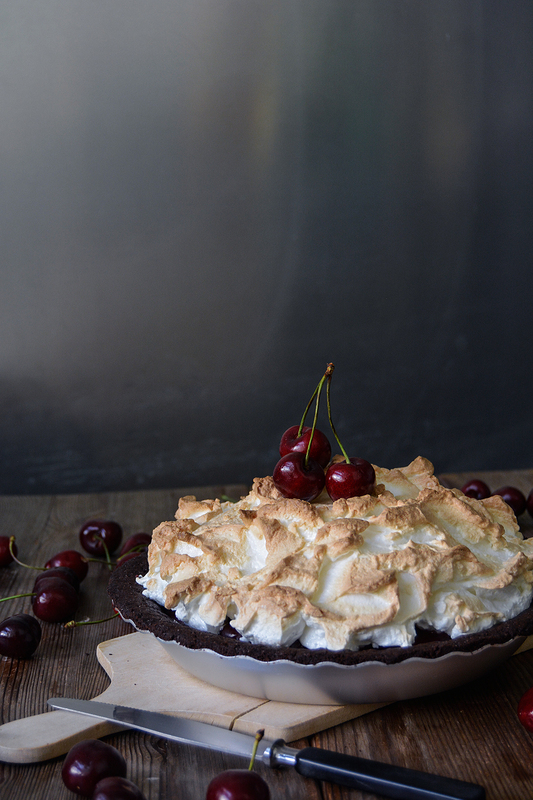 Think of Black Forest Torte and meringue pie, take out the heaviness of the whipped cream, and you have a rough idea of the taste of this opulent beauty. 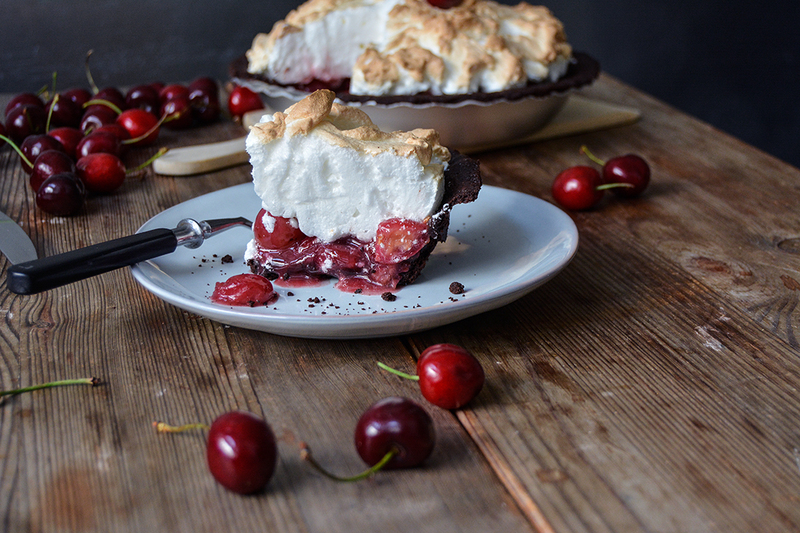 My Cherry Chocolate Meringue Pie has all the nice features of the famous southern German coffee table classic, including dark chocolate, Kirsch Schnaps, and sweet summer cherries – it’s just lighter. My Maltese Mama Jenny was the first baker who introduced me to meringue pie, her formidable lemon meringue pie blew my mind. 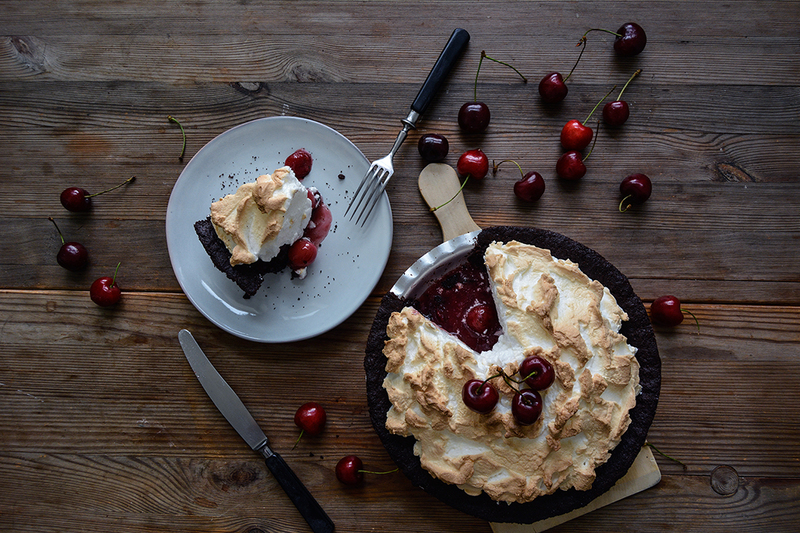 Although we have similar cakes in Germany, like a sponge cake layered with gooseberries and meringue, it doesn’t have the same qualities as a pie. It’s richer, a proper German torte. A pie, however, focuses on the fruit filling, there’s only a thin buttery short crust base holding all that lusciousness together. 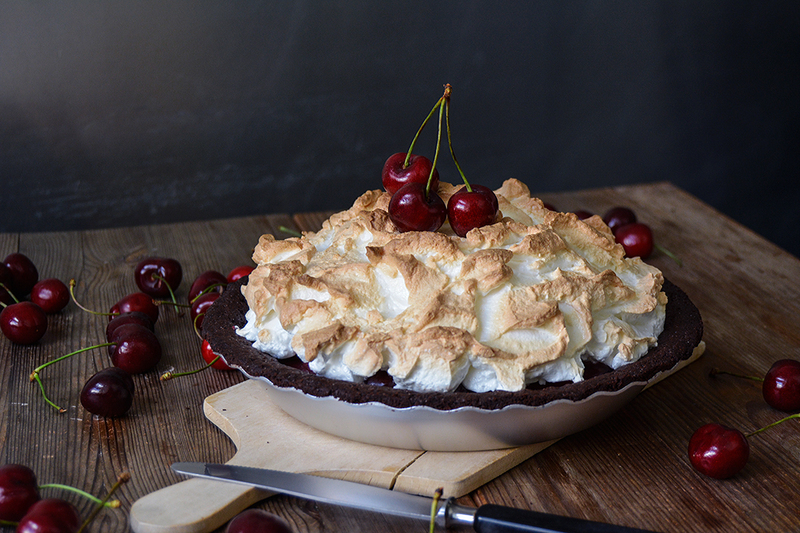 The wonderfully fluffy, airy meringue topping adds a very fine sweetness, wrapped in fragile crispiness. It works perfectly with sour rhubarb, a pink spring pie that became a popular recipe on the blog. 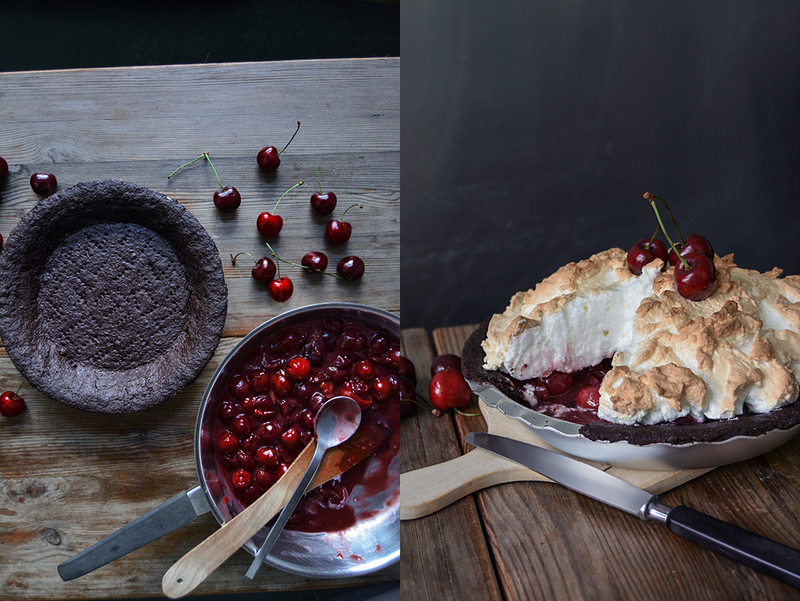 I could have used the same formula for my plump black cherries, but I wanted a chocolate base. 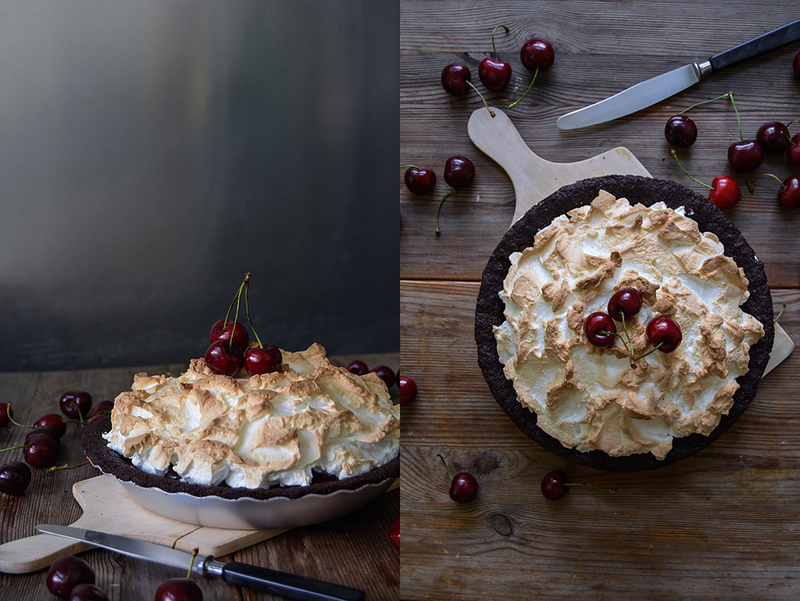 I couldn’t get it out of my mind and I’m glad that I didn’t, it’s the perfect Schwarzwälder Kirsch Pie (the German name for black forest). 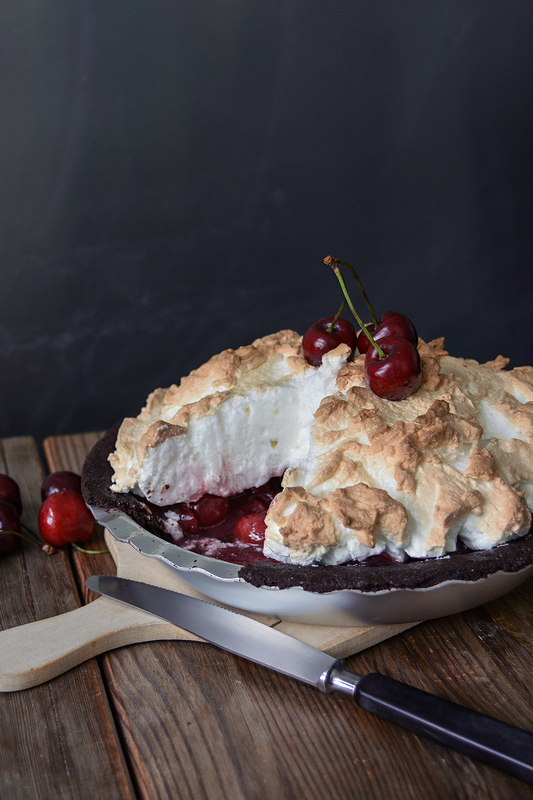 You’ll need a 23cm / 9″ shallow pie dish for this recipe. For the cherry filling, in a medium saucepan, heat the cherries, sugar, and cinnamon over medium heat, stirring constantly. When the sugar dissolved, stir in 2 tablespoons of the schnaps, close with a lid, and cook for about 5 minutes or until the cherries soften. Turn the heat down to low. Add 2 tablespoons of the liquid of the cherries to a small bowl and whisk in the cornstarch until smooth, pour back into the saucepan, stirring constantly until well combined. If you’d like the schnaps to be more prominent, add 1 tablespoon of the spirit. Pour the cherries and all the liquid into a wide pan and let them cool completely. For the pastry, in the large bowl of a stand mixer fitted with the hook attachment, combine the flour, cocoa, sugar, and salt. Add the butter and use a knife to cut it into the flour until there are just small pieces left. Quickly rub the butter into the flour with your fingers until crumbly. Add the water and, using the hooks of the stand mixer, mix until combined. Form the dough into a thick disc, wrap it in plastic wrap, and chill in the freezer for 15 minutes. Preheat the oven to 210°C / 410°F (conventional setting). On a table or countertop, place the dough between 2 sheets of plastic wrap and use a rolling pin to roll it into a circle, large enough to line a 23cm / 9″ shallow pie dish. Push the pastry into the dish, trim any excess dough off the rim with a knife, then prick the pastry all over with a fork. Bake for 15 minutes. Let the pastry cool completely before you assemble the pie. In the large bowl of a stand mixer, whisk the egg white and salt for 1 minute. Adding the sugar gradually, continue mixing for about 1-2 minutes or until stiff. Pour the cool cherries and all the liquid on top of the pastry. Scrape the stiff egg white on top, shape it to a dome and form little peaks with a knife to create an uneven surface. Bake for 7 minutes or until the top is golden brown and crisp. Let it sit for about 30 minutes before serving, the cherries need to set. The pie tastes best on the 1st and 2nd day, however, you need to keep it in the fridge, which softens the pastry. 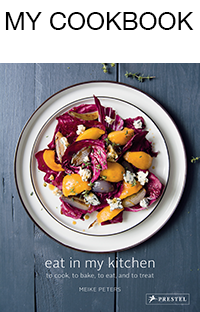 It looks (and probably tastes) wonderfull. 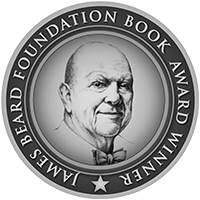 I’ll try to make a pie spectacular as yours next saturday. Thank you for sharing Meike. 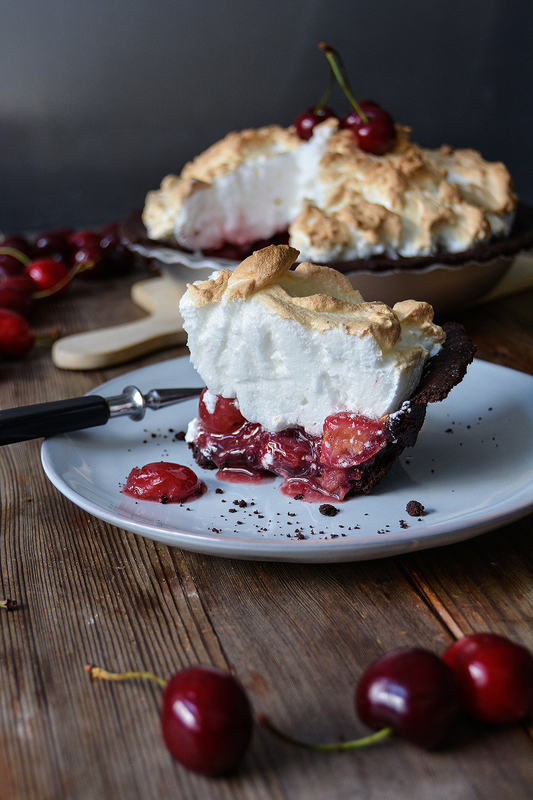 Oh, I loved this pie. 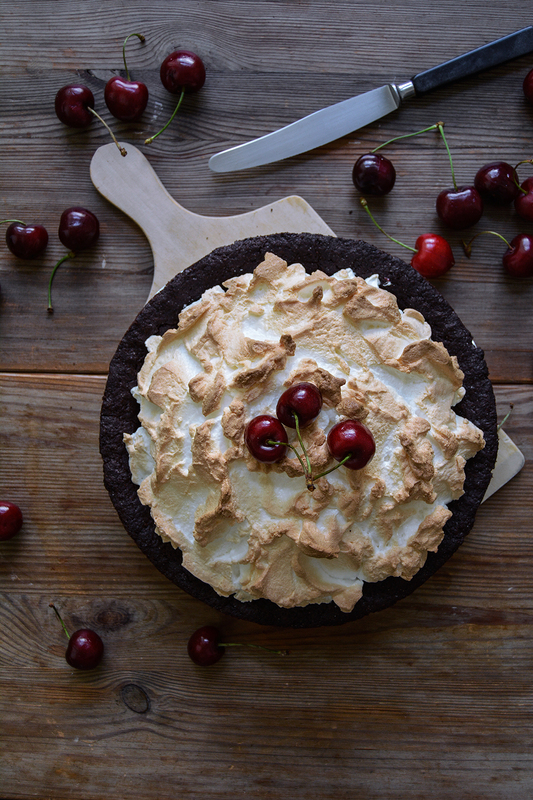 I’m a big fan of Black Forest Cake and this really feels like a lighter version of it 🙂 Enjoy the recipe, Catherine! This is spectacular! 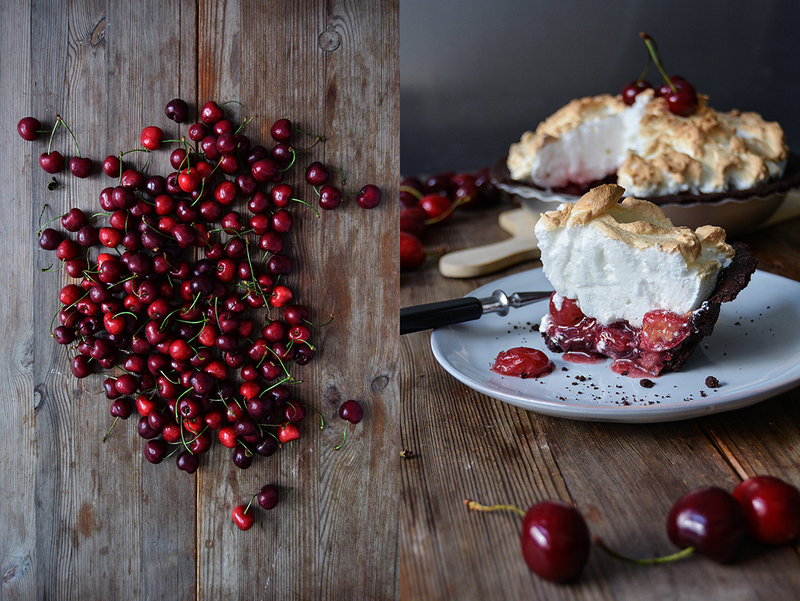 Such a different take on a cherry pie – looking forward to baking one!